Are you trying to start a profitable blog? This book will show you exactly what you need to do to start a profitable blog today based on what top bloggers are doing. If you follow the instructions you'll have an amazing looking and profitable blog in no time at all! The Ultimate Guide is short, easy to read and reads (and looks) like a blog post with lots of white space, headings, and first person text. Is The Ultimate Guide Worth the Money? The Ultimate Guide on How to Replace Your Job with a Blog is available as a Kindle download. The Kindle price is $0.99 (this review was written in early January, 2017), which I think is a reasonable price for the size and quality of the book. A paperback is available for $18.99; I definitely do not believe it is worth that--for one thing it is only 53 pages long. You can check my book blog to get a better idea of what my ratings means. I'm giving The Ultimate Guide on How to Replace Your Job with a Blog a B-. It had some information I consider valuable, primarily dealing with affiliate income; however, the writing quality was not professional. This month I am a Kindle Unlimited member andThe Ultimate Guide on How to Replace Your Job with a Blog is one of the books available to members under their pay one price monthly membership. The books I review on this blog will all focus on some aspect of personal finance. Part of my review process is to find at least one new-to-me, or previously untried thing in each book to put into action to improve my personal/family financial situation. I will then blog again a month after the review to let you know what exactly I did and what results (if any) I have had from that action. Set up an email list. I've never really seen the point--I want people to read my blog (and see the ads which are my source of income); not read a newsletter. The Ultimate Guide suggested a newsletter containing affiliate links. The book links in this post are Amazon Associate links. If you click them and purchase from Amazon, I get a small commission but you do not pay more for your product. Seriously, if you are single with no children, all your income is from employers who issued W-2s and you don't have any investments or retirement accounts, you can probably complete a 1040 EZ manually in less than 30 minutes. The only problem with this is that you'll have to file by mail, which will delay your refund. There are a variety of online programs that allow ordinary people who are not accountants to accurately complete most tax returns. If your adjusted gross income is less than $64,000, you have access to a variety of commercial programs via IRS Free File. You must enter the program via the IRS website, not the program's website, in order to use them at no cost. The companies may (will) try to "up sell" you but the basic return will be free. If your income is more than $64,000 or you need specialized forms you may need to upgrade to paid versions of the programs. Nevertheless, unless your financial situation is extraordinarily complex, you should be able to complete your own return with online software. Besides price, the main advantage to completing your own return is that by the time you are done you have a clear understanding of where your money is coming from and how it is being taxed. Some very intelligent people have told me that their mortgage payment is tax deductible and that's why they keep making it, rather than paying off the house. The mortgage payment isn't deductible, only the interest is--and it is only truly deductible if it and your other deductions are more than the standard deduction of $12,600 for a married couple who files jointly. If you do not qualify for IRS Free File, different programs have different costs and features. 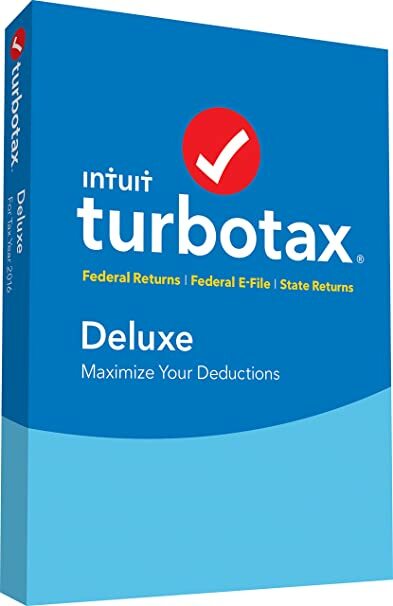 Turbo Tax is the most robust package and in fact your W-2, 1099 or other tax document may have their logo on it along with a data entry shortcut. Turbo Tax allows you to take photos of many forms and import them, possibly saving you time on data entry. Turbo Tax is also often the most expensive program. On the other end of the spectrum is FreeTaxUSA which never charges for federal returns and charges only $12.95 for a state return. The interface of FreeTaxUSA is not as fancy and it lacks Turbo Tax's import features. The main thing to watch out for with the online programs is the up-sell. Many of them lead you though a long and involved interview/data entry process which prepares the proper forms. However, the "free" return you signed up for does not include many of your forms and you only learn the true cost of your return when you go to save or file it. They are betting that you won't want to do all that work again and will just pay the money. The online packages all offer e-filing as part of their service. If you don't like the idea of your personal financial information being on some company's website, you can purchase programs like Turbo Tax or one from H &R Block. . They can be downloaded or bought in a store on a disc. The price may or may not include efiling. Before purchasing a package, review the contents to make sure the package you buy includes the forms you need. Once you have downloaded and installed the software, you don't have to worry about Internet connections so your may be able to move more quickly through unneeded screens. Most packaged software allows you to prepare more than one return per license so if you have multiple family members who need returns, they should be able to share the software. When many Americans think taxes they think H&R Block, even if they've never used H&R Block's services. H&R Block and similar seasonal storefront tax preparation services hire relatively low wage help and train them to complete tax returns by using software similar to that listed above. While some of these people actually learn something about taxes during their training and tenure, according to Glass Door, the average seasonal hourly tax preparer makes $10-15/hour and at that rate, you aren't getting much expertise. They use a computer-generated interview to fill out forms. If your taxes are simple enough to entrust them to H&R Block, Jackson Hewitt and the like, they are simple enough to prepare on your own computer for less money. If preparing your taxes takes real accounting, then hire a CPA. The CPA will be able to compute your profit and loss for rental properties or business ventures. He or she will be able to advise whether certain things are deductible, and will be able to give you advice about how to save money on taxes next year, even if he or she can't reduce this year's taxes. Enrolled Agents are non-CPA tax professionals. They, along with attorneys and CPAs can represent you in front of the IRS. If all your income is reflected on tax forms issued by business or brokerage houses, a CPA is probably overkill, unless you just plain don't want to fool with it. However, it has been my experience that the most time-consuming part of preparing your taxes is gathering the information needed, and you have to do that whether you are going to do your own taxes or farm them out to someone else. 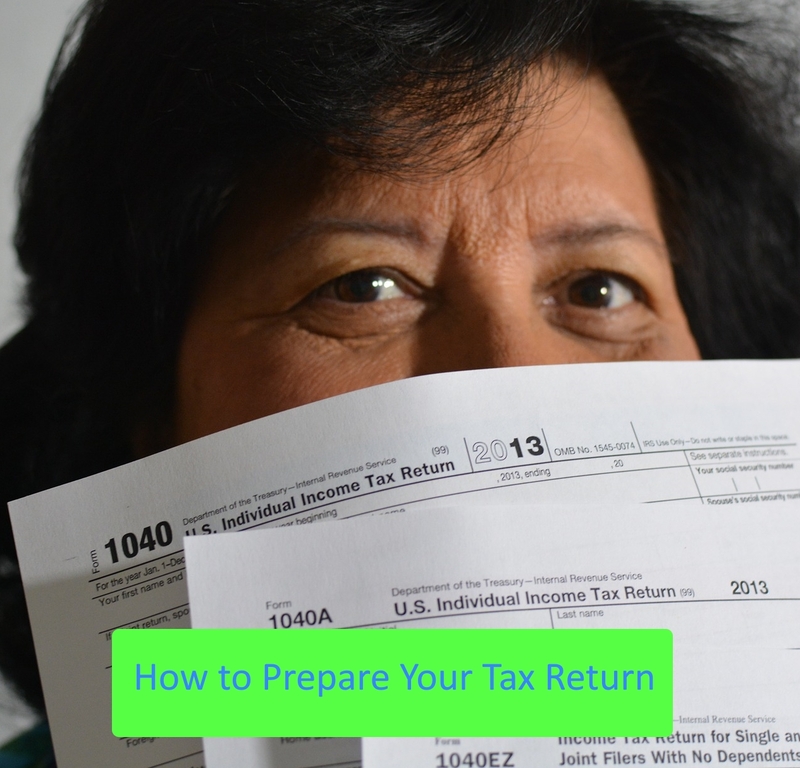 While there are people who have complex tax situations which require the advise of a professional, the vast majority of Americans are perfectly capable of preparing their own tax returns. This year I am doing a "Book of the Month" feature on this blog. Besides the standard book review, since I am reviewing books dealing with finances, and since I by no means claim to know everything there is to know about finances, I am going to try to find at least one "Take Action" step in each book--one thing I can do to improve my knowledge, investment or blog. In January, my book of the month was Step by Step Investing and I reviewed it here. 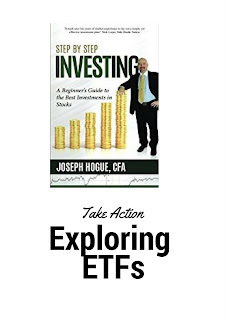 One thing Joseph Hogue talked about was ETFs, which are exchange traded funds. ETFs are the new "in thing" but I've never been able to figure out why they are preferable to mutual funds. This month I decided to review some Vanguard mutual funds and their corresponding ETFs and see what the difference was. My largest loss was a day that I realized the highly respected mutual fund, that had most of our savings, was going down. I put in the sell order immediately. I did not realize that a mutual fund only sells at the end of the day. I lost a LOT of money that day- and had to pay my broker $80 for the transaction. I realized that by reading Step by Step Investing: A Beginner's Guide to the Best Investments in Stocks I had learned that had Janette's money been in ETFs rather than mutual funds, her sell order would have been executed immediately (however her broker defined that word), rather than at the end of the day. So, presuming the share price was higher when she said "sell" than it was at the end of the day, Janette would have been better off at the end of the day. How Are Mutual Funds and ETFs Alike? Both mutual funds and ETFs are baskets of stocks. They can be actively managed with a human (or more likely a team of humans) studying various companies and deciding which ones to buy stock in or they can be index funds where a computer buys and sells stocks to mimic an index of one sort or another. For example, I own shares of Vanguard's Total Stock Market Index Fund which tries to mirror the U.S. stock market as a whole. About 2.4% of the stock market consists of telecommunication companies so about 2.4% of that fund is made of telecommunications companies. Both ETFs and mutual funds are required to define a style of investing, publicize it and stick with it. If you say you are running a small cap fund (one that buys companies with capitalization below a certain amount) then you don't buy stock in Johnson and Johnson, even if it is the dividend investor's stock of the week. How are Mutual Funds and ETFs Different? Let's look at my very simplistic fund. On a per share basis, it is 1/3 X, 1/3 Y and 1/3 Z. Today, X closed at $10 per share but during the day it sold for as high as $12 and as low as $8. Y closed at $20, which was its high point for the day. For much of the day is sold close to $15. Z closed at $5, its lowest point in the day, but there were times during the day when it reached $6. It just so happens in my perfect simplistic world that at 3:00 p.m. X was selling for $12, Y for $15 and Z for $6. If my fund was an ETF and you bought or sold it at 3:00 p.m, your share price would be $33.00 per share. If you bought or sold at the end of the day, the share price would be $35.00. If my fund was a mutual fund, your cost per share would be $35 because mutual fund shares are only valued and traded at the end of the day. Well, if you are in Janette's position, being in an ETF rather than a mutual fund can make a big difference, for good or for bad. If Janette had been able to sell before the bottom dropped out of the price of her fund, she would have been better off. Of course, if the price of the shares had bounced back up by late afternoon, selling at the end of the day would have been a good thing. But what about the day to day, for those of us who just invest our money and leave it sit? This chart looks at two Vanguard funds which are available as ETFs, regular mutual fund shares or Admiral mutual fund shares (meaning you have more than $10,000 worth of that fund). You can see that in both cases the Admiral shares and the ETF had similar expense ratios that were noticeably lower than the Investor (regular) shares. From what I could see, there was no minimum investment in the ETFs. If you had invested in those funds ten years ago, you would have paid the fees listed in the second column and the final column shows the value of today of $10,000 invested ten years ago. It appears that for small accounts, the fees on ETFs are less than the fees on mutual funds with the same assets and management. We are thinking about investing in another Vanguard Fund, and rather than another mutual fund, it will be an ETF, since the initial investment will be too low for Admiral shares. It is not uncommon for people who log onto Amazon.com to be greeted with an ad for Kindle Unlimited. The question may have is whether Kindle Unlimited is worth it; whether it is worth the $9.99 subscription cost. The answer, of course, is "it depends". What Does Your Kindle Unlimited Subscription Get You? A Kindle Unlimited subscription gets you access to a large library of e-books, which can be read on any device that has a Kindle app on it. It also allows access to a number of current magazines and to some audiobooks. Kindle Unlimited members are limited to ten items at a time; with Kindle Unlimited, you are borrowing the items, not buying them. In order to access the eleventh item, you have to return one of the previously borrowed items (and you are prompted to do so). Most of the books available via Kindle Unlimited are self-published ebooks. While that does not mean they are not good books, it does mean that if you are joining Kindle Unlimited in hopes of having unlimited access to the latest best-sellers, you will be disappointed. What Are the Alternatives to Kindle Unlimited? Scribd is another ebook rental service which can be used for all devices except non-Fire Kindles. It offers 3 books and 1 audiobook each month — plus unlimited access to magazine and news articles, sheet music, documents, and special select titles for $7.99/month.My perusal of their website indicates that they have more "big-name" authors' books available than Kindle Unlimited does, however, I did not find the latest books by the authors for whom I searched, nor were their complete catalogs available. Your Public Library probably has ebooks available for download 24/7 at no cost beyond that of a library card. In my experience, I am more apt to find the big name authors' books at the library than on Kindle Unlimited, but the latest books may not be available, or may have long waiting lists. Prime Reading. If you are an Amazon Prime member, one of your benefits is Prime Reading, which is the ability to access, at no additional cost, some ebooks and magazines. While Kindle Unlimited offers over a million books, Prime Reading offers only about 1,000. Amazon Freebies. Don't scoff too quickly. At any given time Amazon offers thousands of free books. Some are free on a temporary promotional basis. Established writers will make a back-list book free on Amazon shortly before a new release, hoping that those who read the freebie will buy the new book. Often self-published writers have one or more books free on a permanent basis, again hoping that after you enjoy the freebie you will buy other books from them. Finally a lot of classics which are not under copyright are free as well. Is Kindle Unlimited for Me? If you are considering Kindle Unlimited, I suggest going to Amazon's website (and I'd appreciate it if you would use the handy affilliate links in this post--I get paid and it doesn't cost you more) and searching for books you want to read. Browse by genre, author, subject, whatever, and use the "eligible for Kindle Unlimited" filter. Save the books to your wishlist. When you have enough to keep you busy for a month, then sign up for Kindle Unlimited. Re-evaluate your choice every month, and remember that you can stop your membership at any time, and rejoin at any time. While you only get one free trial month per account, if you batch your reading into Kindle Unlimited months and other months you may be very happy with just three or four Kindle Unlimited months per year. Kindle Unlimited is like most subscription services--It is worth it if you use it and enjoy it, and can afford it. Otherwise, like most subscription services, it turns into money that goes regularly into the pocket of a business whose services you are not using. As you move through life, you make mistakes. Someone once told me, "Another name for something that hurts like hell is a learning experience". Most of us remember the pain caused by our mistakes and while many of us try to keep our children from making the same mistakes, all too often, they, like we did, have to learn the hard way. Most of the money we put with the financial advisor was in retirement accounts; however there was a sum of money in a taxable mutual fund account that had been there for over fifteen years. When the financial advisor moved that money to his firm, he sold the mutual fund, creating a taxable event. All that profit over all those years was now taxable income. Before switching from one investment to another, consider the tax consequences and whether they are worth it. If you lose 15% of your investment to taxes to gain 1% a year in gains, it will take over 15 years to make up what you lost in taxes. While the fault of no one in particular, there was a lag between the day our old investments were liquidated and the day the financial advisor bought new ones, and because of market movement, it meant that we lost money. In other words, the market was "low" when we sold, and then went up before our money was reinvested. Shortly after that money was put in new investments, it went down again. The money was invested in August, 2014. A portfolio I put into Morningstar shows that, looking strictly at share price and not counting dividends, the mutual fund shares purchased that day are still worth 6% less that what we paid for them. If switching to a financial advisor or broker means liquidating a large amount of money and then reinvesting it all at one time, this is a real risk. While it may not take you as long to recover as it has taken us, dollar-cost averaging is a proven way to reduce risk, and taking "all" of your money out of account 1 and moving it to account 2 means buying market risk. Consider only giving the new company new money, especially until they have proven themselves. Mutual funds have expense ratios. Someone has to pay the people who are running the fund, and those people are the investors. I don't work for nothing and I don't expect others to work for nothing. However, before investing in a mutual fund, compare its expenses with those of its peers. While you may think it is worth it to be in the hot fund that is making money this year, the odds are that if not next year, then the year after that, the fund will find itself back in the pack. Why do you want a financial advisor? I know it seems basic, but there is a reason you are considering hiring someone. What is it? If you tell me you want to fix up your house and I send a plumber over, that's great, if the pipes need work. If you want someone to run electrical wires, then I haven't helped. Do you want someone to pick investments? Help you budget? Give you tax advice? If you don't know what you want, figuring out if you get your money's worth is tough. Without consulting anyone about the cost, think about what YOU think that service is worth. I'd love for you to come clean my house, and I'd be glad to pay you $10 a week to do it. $100? Nope. The fact that it would cost closer to $100 per week than $10 per week for a housekeeping service is why my kids clean my house (I have to feed them anyway). When you interview a potential financial advisor, go through your "want" list. Is that what s/he does? If not, keep looking. Tell them you have $X dollars to invest and ask what your yearly fee would be. Ask in dollars and cents and if you get all sorts of ifs...percentage...variable, and can't pin them down to a number assuming a certain account value, move on. Realize that 1% of $100,000 is $1,000 and ask yourself if you'd be willing to write someone a check for $1,000 for the service you are trying to buy. Other finacial planners are commissioned sales people. Again, give some if/then scenarios and find out what you will end up paying them and decide if it is worth it. In my opinion, and I'm not a financial professional and you take my advice at your own risk (but you aren't paying for it either) most people should invest in a diversified mutual fund portfolio and if you don't want to pick that portfolio yourself, go to one of the big companies (Vanguard, Fidelity, T Rowe Price are three) and buy a target date fund. This is a mutual made of mutual funds and is rebalanced to the level appropriate to your target retirement date. When we hired a financial advisor we did not realize how much it would cost us to change our mind. When we moved away from using HD Vest to manage our investments, they charged us $90 per account to close our accounts, and we had three accounts with them (my husband and I each had an IRA and we had a taxable account). Each of those accounts was invested in 22 different mutual funds. While I don't know what it would have cost to have HD Vest liquidate the account and send us the cash, moving the account, with all those mutual funds, to Vanguard means that we will pay $20 each to sell them--in other words, whether we sell those funds today, tomorrow or ten years from now, we will get hit with a $20 per fund per account fee. In other words, it will cost us a total of $1,320.00 to get our money. If you want to move your invesments from one place to another, find out all the fees involved and see whether you are better off liquidating or moving securities. Even better, before you put money somewhere, find out what it will cost to move it elsewhere. The money you put into a Roth IRA is taxed before you put it in, but the earnings are tax free and you can withdraw your contributions at any time. If you are young, this type of account gives you the flexibility to save for retirement while still keeping the money accessible, if necessary for expenses like college tuition or a new car. These allow a current tax deduction on your contributions and allow investments to grow tax-deferred. You'll pay taxes on this account when you withdraw the money. In a standard account, if you buy a stock for $10 and sell it for $20, you pay capital gaines taxes on the $10 differences. In an IRA, you get to reinvest the who twenty. For various reasons you may want to have some stocks or bonds in a regular account. The trick to minimizing taxes is generally to minimize transactions. Going back to the stock we bought for $10 and is now worth $20. If you sell it, you create a taxable event. If you have a good reason to sell, go ahead, but realize what you are doing, and the consequence. Some stocks are purchased because you expect a long term increase in value; others are purchased because they pay dividends. Taxable accounts are better for growth stocks; you keep more of the income from income stocks if they are in a retirement account.